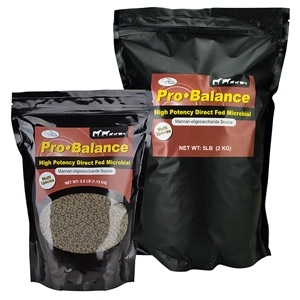 Pro-Balance is a high potency daily feed prebiotic and probiotic supplement to help improve digestive health and nutrient absorption. High potency direct fed microbial. Mannan-oligosaccharide source. Safe and effective to feed to horses, pigs, sheep, goats, llamas, alpacas, chickens, ducks, geese and cattle. 2.5 & 5 lb. bags.